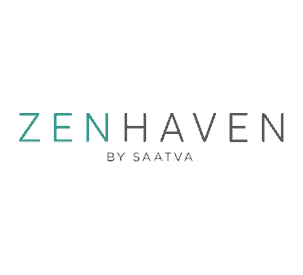 For environmentally conscious folks looking to snag a bed that’ll fit into their green lifestyles, the all-latex Zenhaven mattress from Saatva could be a great option. Constructed with lush New Zealand wool, organic cotton and American Talalay latex, this bed is about as all-natural as it gets. 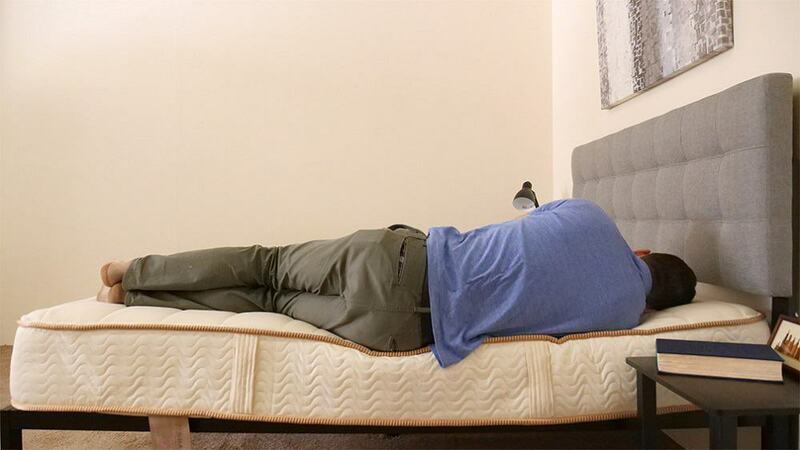 Today, I took my magnifying glass to this American-made mattress, putting it through a series of rigorous tests to see how comfortable it actually is and to determine what kind of sleeper it’d be best for. 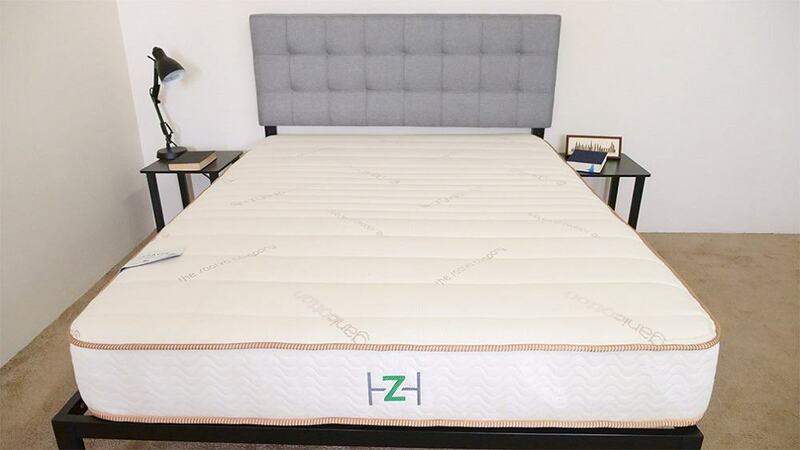 Continue reading below for my full review of the Zenhaven mattress. Don’t have time to read it all? Click here to skip to the bottom and check out my review summary. The Zenhaven mattress is constructed with four different latex layers, stacking up to 9” of comfort. A unique feature of the bed is that it’s flippable, with the two middle layers sandwiched between a luxury plush layer on one end and a gentle firm layer on the other. Depending on how you sleep, you’ll be able to adjust the bed to align with your preferences. Cover – The cover is constructed with 100% organic cotton, making for a soft and breathable fabric. It’s quilted with all-natural wool, which not only contributes to the lush feel, but also absorbs and wicks moisture away from the mattress for a pleasant cooling sensation. 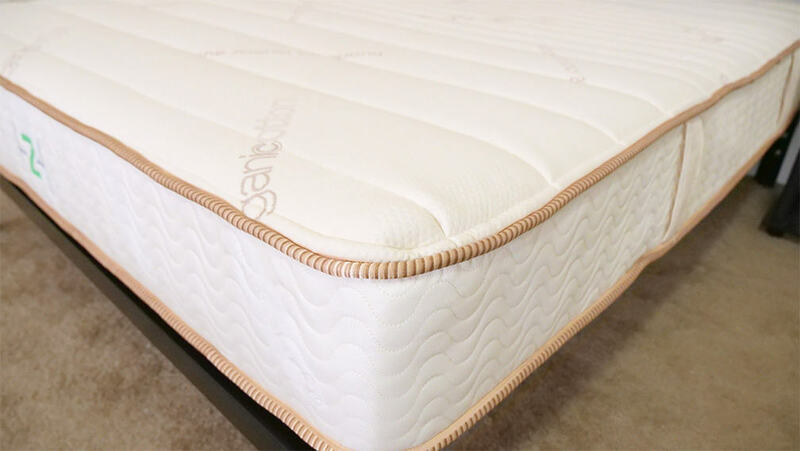 Comfort Layer – We started off our review with the luxury plush on top, so we’ll treat it as such here, keeping in mind that it could also be the bottom layer if a sleeper preferred something firmer. The plush layer is made with 1.5” of Talalay latex and is soft to the touch. There’s a lot of give here, so you’ll feel a subtle sinking feeling when you press into this section. 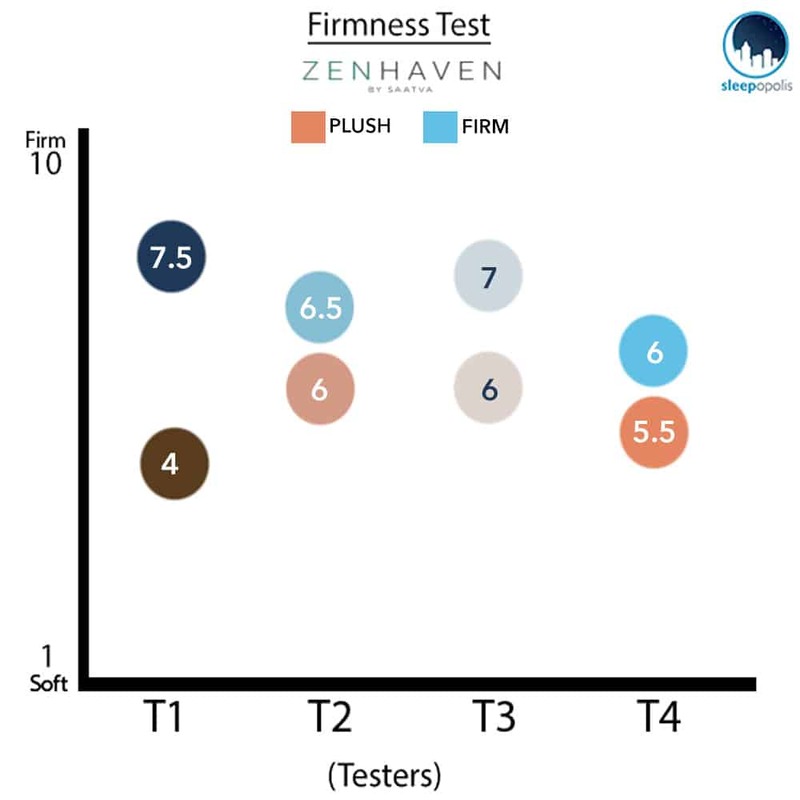 After taking a look at the construction of the Zenhaven, let’s chat about the firmness and feel. I started off by applying some light hand pressure to the plush side of the mattress and instantly felt the soft give of the quilted wool cover. As I pressed in further, I felt some responsiveness from the latex, which is typical of the material. When I flipped the mattress around to have the gentle firm side on top, I noticed that there was less give than there was with the plush layer. That being said, it was still supportive and had quality bounce. It also felt cool to the touch, which isn’t surprising given latex’s well-known reputation for temperature regulation. At this point I’d like to note that people of different body types and shapes will feel firmness differently. Rather than giving just my opinion on the overall firmness level of the Zenhaven, I enlisted three other people to give their opinion as well. This will give you a better sense of the firmness range you can expect from the mattress. With responses in the 4-6 range for the luxury plush side of the mattress, the testers felt that it had a fairly soft feel. 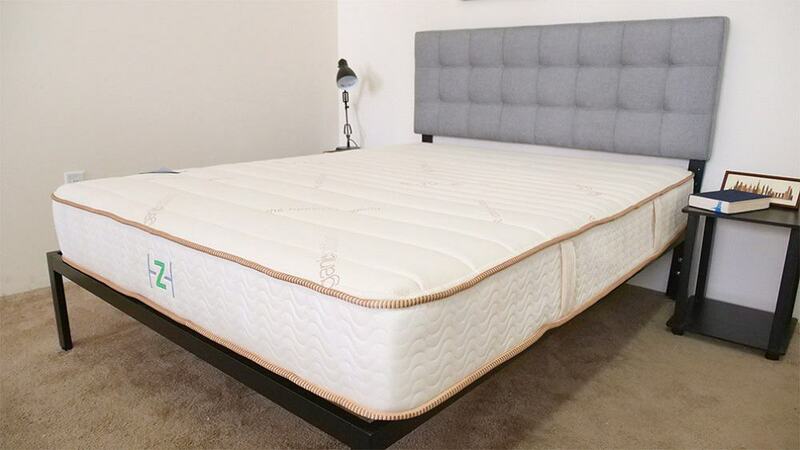 When we flipped the mattress over to have the gentle firm layer on top, the testers gave responses in the 6-7.5 range, indicating that they found it to be of a more medium firmness. 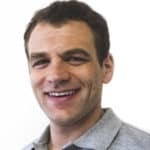 The variance in these results demonstrates the versatility of the mattress, a potentially valuable characteristic for sleepers who aren’t sure if they want a soft or firm bed. I personally rated the plush top a 4 and the gentle firm side a 7.5, proving that this mattress can really be as soft or as firm as you want it to be. If you’re a side sleeper, I’d suggest putting the plush layer on top and doing the opposite for back and stomach sleepers. While the feel may shift depending on the orientation, the bounce from the latex remains the same and makes it easy to shift positions and get out of bed. Rather than just describing the feel of the Zenhaven to you, I wanted to give a visual representation of where someone may feel pressure points form while lying on it. To do this, I placed a pressure map on top of the mattress and lied on my back, side, and stomach. You can see the results on the image below where pressure is represented from blue (low pressure) to red (high pressure). 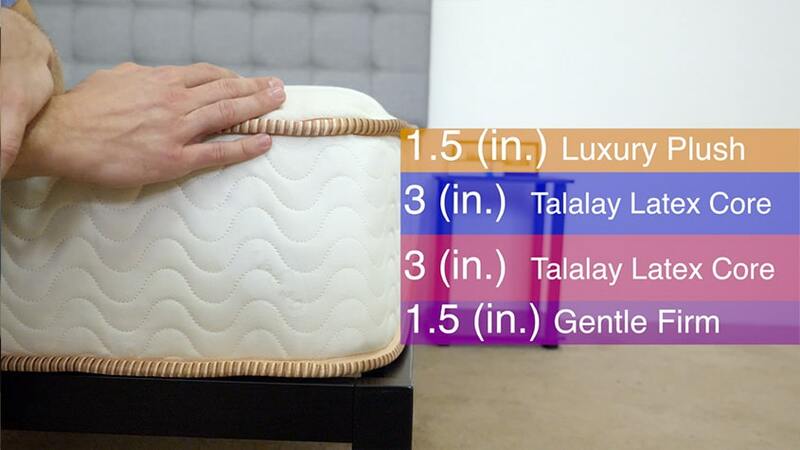 I conducted this test for both the luxury plush and gentle firm sides, starting with the plush layer on top. Back – Lying on my back, I felt relatively low pressure throughout my body, thanks to the soft latex foam. While I did feel like I was sinking into the mattress a bit, I didn’t feel trapped or stuck. 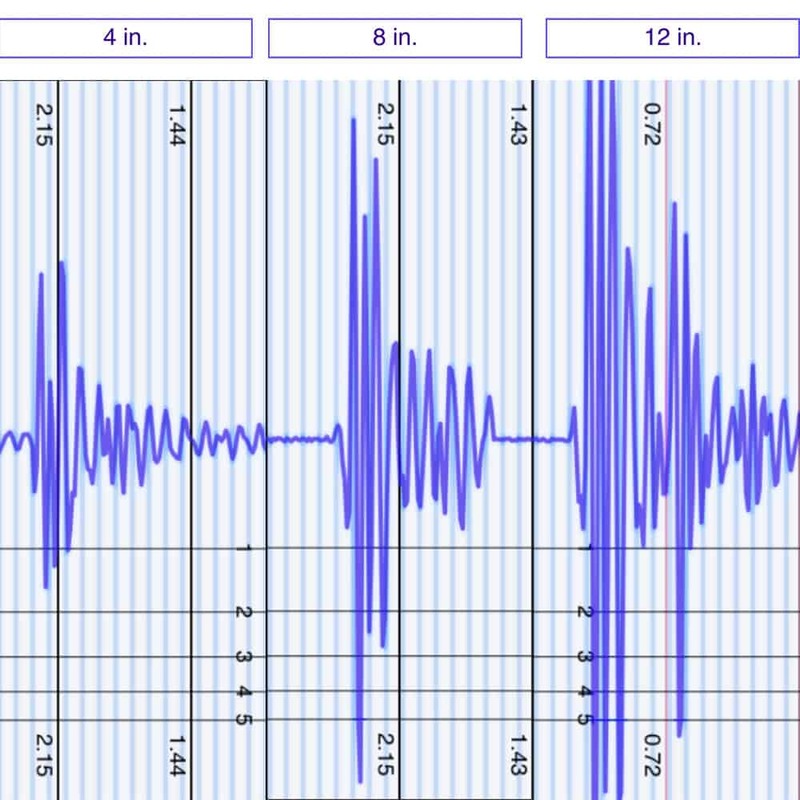 Side – Rolling onto my side, I felt pressure at my hips and shoulders, which you can clearly see in the graph above. I tried a few different positions on my side and felt fairly supported in all of them, but wouldn’t suggest this bed for a career side sleeper. 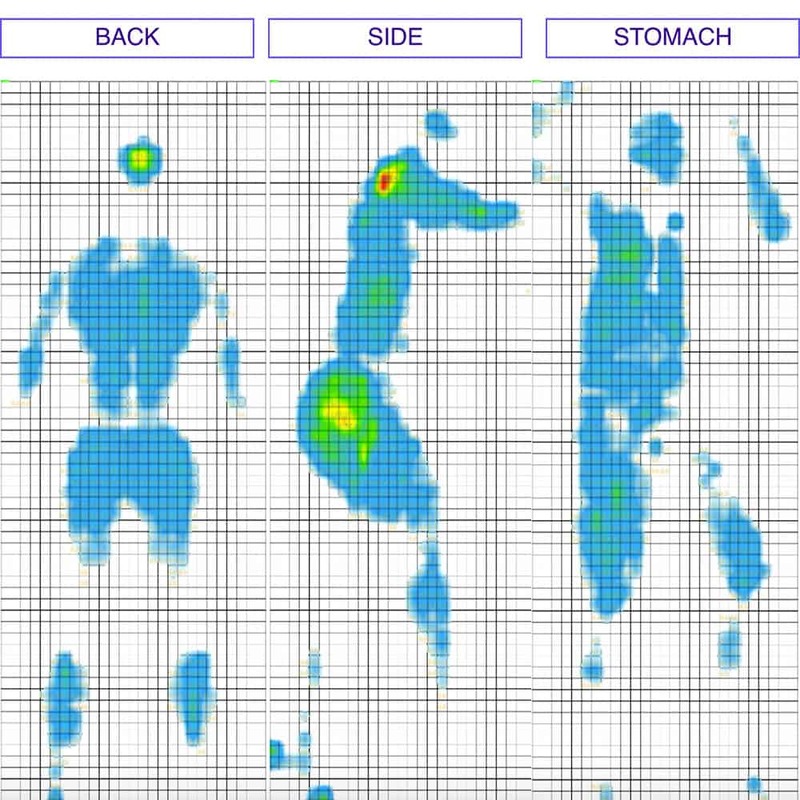 Stomach – And finally when I switched to my stomach, I felt some light pressure at my sides, but not in a deterring way. The top layer caused my hips to rise slightly—a typical problem for stomach sleepers—but I still felt comfortable in this position. And now onto the gentle firm top. Back – Lying on my back, I felt less pressure throughout my body than I did with the plush layer on top. I felt like I was on top of the mattress and could move around easily. Side – As you can see in the graphic, I again felt tension at my shoulders and hips once I rolled onto my side. While I wouldn’t say I felt uncomfortable in this position, I’m not sure that I felt as supported on my side as I did on my back and stomach. 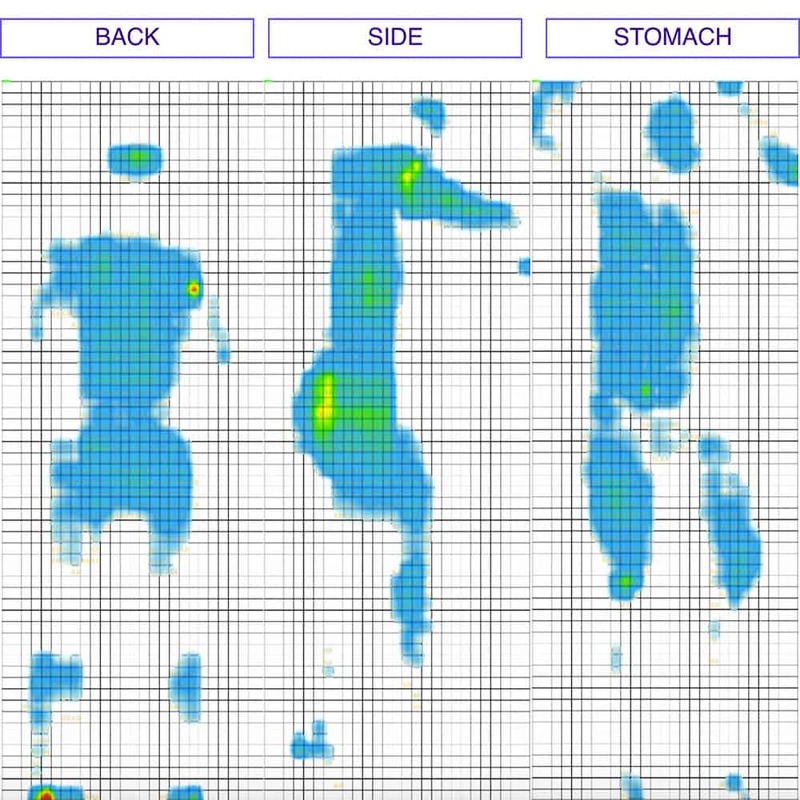 Stomach – And finally when I switched to my stomach, I felt some light pressure, but nothing out of the ordinary. The gentle firm top is great for a stomach sleeper as it keeps the hips up and out of the mattress. Once again I’ll start with the plush layer on top. With the plush side on top, the Zenhaven shows a medium amount of disturbance for the 4 inch drop, which simulates someone rolling around and adjusting their position on the other side of the bed. 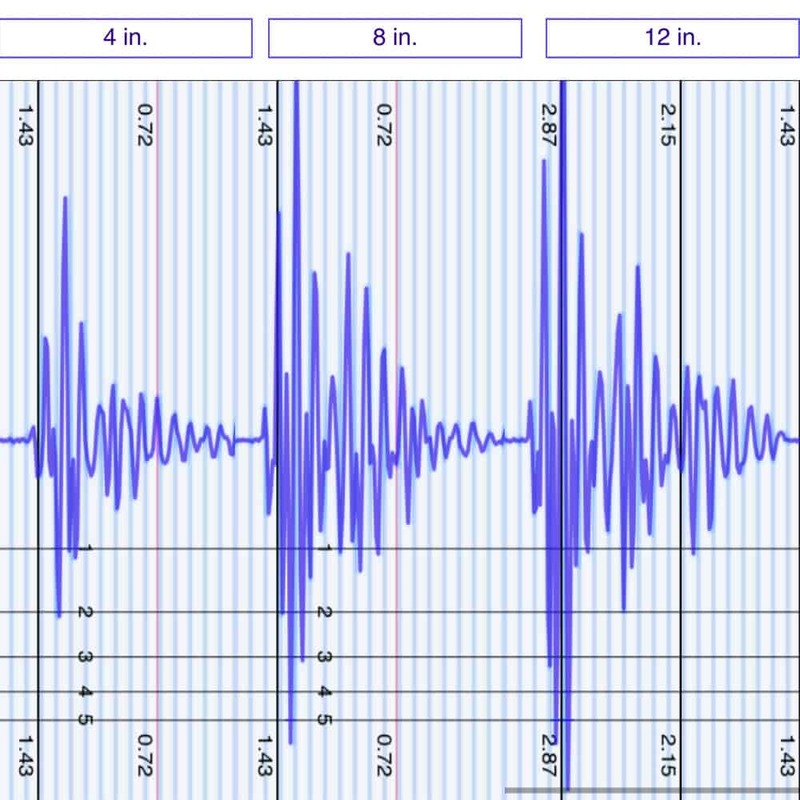 The 8 and 12 inch drops show larger spikes in disruption, which is to be expected from a latex mattress. While the Zenhaven does a fairly good job of containing motion, its main material makes it so that you’ll feel your partner’s movements. And now for the gentle firm top. Oriented with the gentle firm layer on top, the Zenhaven experienced even more dramatic spikes in activity when the ball was dropped. This isn’t necessarily a bad thing, but does suggest that the added firmness of this side could contribute to more noticeable motion transfer overall. These results show that you’ll definitely experience some sinkage in this orientation, which isn’t shocking considering the give of the luxury plush top. I felt myself sinking into the mattress across sleeping positions, which may not be ideal for those of you who snooze on your back or stomach, but is great for side sleepers. By flipping the bed over to the gentle firm side, you’ll experience less sinkage than with the Luxury Plush top layer. This will work wonders for back and stomach sleepers and the bounce of this orientation will provide some additional support overall. If you’re going to share your bed with a partner and need to use the entire surface area of the mattress, it’s going to be crucial for you to consider the amount of edge support it’ll provide. Foam mattresses sometimes struggle to live up to the edge support of traditional innerspring mattresses, so I wanted to see how I’d feel lying near the side of the Zenhaven with both the plush and gentle firm layers on top. While lying on my back near the side of the mattress with the plush layer on top, I experienced a bit of sinkage, but also some pretty decent support. I could move around easily and didn’t feel like I was going to fall off the bed. When I shifted over to my side, I still felt pretty supported by the mattress. As with most foam mattresses, I experienced a bit of compression at my shoulders and hips, but was still secure. In this position, I wanted to simulate what it would feel like to be sitting on the bed in the morning when you’re lacing up your shoes and getting ready for the day. A lot of foam mattresses experience severe compression in this position, but the Zenhaven actually held up fairly well. With the gentle firm layer on top, I still felt supported on the side of the mattress and didn’t feel like I’d fall off. Again, the latex imbues the mattress with bounce, which allowed me to shift positions easily. On my side, I experienced a bit of compression, but not enough to make me feel insecure at the edge. And finally in the sitting position I noticed the same give as when the plush layer was on top, but felt a bit more rooted thanks to the gentle firm latex. If you’re convinced the Zenhaven is the right mattress for you, the size and pricing information for the mattress are below. Please note that these prices reflect standard pricing. IS THE ZENHAVEN MATTRESS RIGHT FOR YOU? Now that we’ve taken a closer look at the Zenhaven mattress, it’s time to discuss who it’d be a good fit for. Unsure of the firmness level you need – If you’re a sleeper who can’t quite decide if you want to go with a lush soft mattress or a more firm one, the Zenhaven would be an ideal choice for you given its flippable customization. Want an all-natural product – Constructed with 100% organic cotton, wool and natural latex, this mattress is perfect for the environmentally conscious consumer. Looking for a longer term investment – Latex is a durable material, which means it’s going to last for a long time and extend the value of your mattress. You’re a back or stomach sleeper – The latex throughout gives the bed a solid bounce that’ll support back and stomach sleepers by keeping their hips aligned with their shoulders.